Attendify's registration system allows you to create and sell tickets to your event. You can distribute free tickets, as well as sell paid ones and connect your Stripe account to collect payments from the attendees. Add a description for the ticket. Set sales start and end dates for the ticket. Change a ticket's status: open - can be ordered by attendees, closed - is not available for sale. 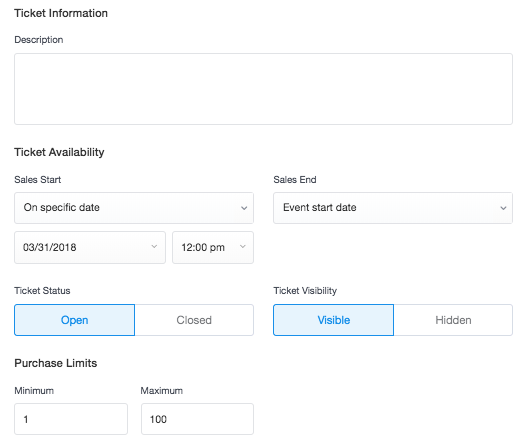 Manage a ticket's visibility: visible - is shown on the registrations page to everyone, hidden - only visible to someone with a valid unlock promo code. You can create a promo code and assign it to the ticket after publishing using management tools. 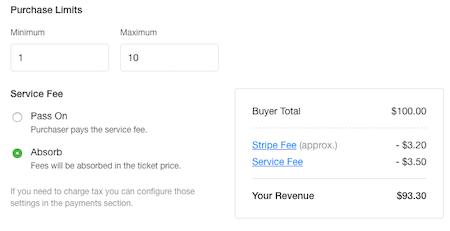 Customize purchase limits, set the maximum and minimum number of tickets that can be purchased in one order. When adding a paid ticket to your registration you can also manage how ticket fees are being processed. They can either be absorbed into the ticket price or you can make it so that the ticket purchaser would pay the service fee and taxes on their own. Please note that Stripe fee cannot be passed on, and it varies depending on the type of the credit card used by the purchaser. 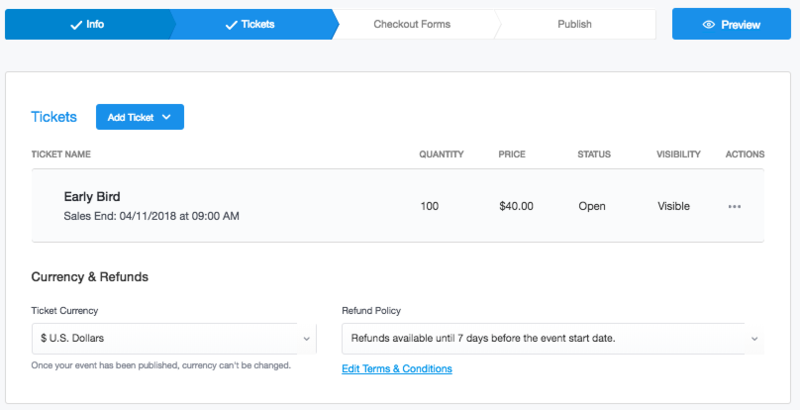 Once you've added a paid ticket, on the tickets step you will see the options to specify tickets' currency, customize refund policy and/or add tax options. Please note that after publishing your registration, you will not be able to change the currency or Terms & Conditions. If you have paid tickets added to your registration, a Stripe account needs to be connected to it to proceed to the next step. Need help creating a Stripe account or connecting it to your registration? Please check this article.